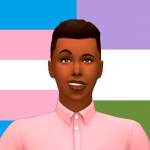 This is a main thread I'm starting to collect the stories that I've posted the last couple days in another thread or two. The narrative ball gets really gets rolling around the third post, had to figure out a style. 2. I'm on summer break which means I have extra time to do these posts, but I'm starting a summer course soon and can't promise daily or weekly updates or anything, but I'll do my best not to leave you hanging too long if you like the story. 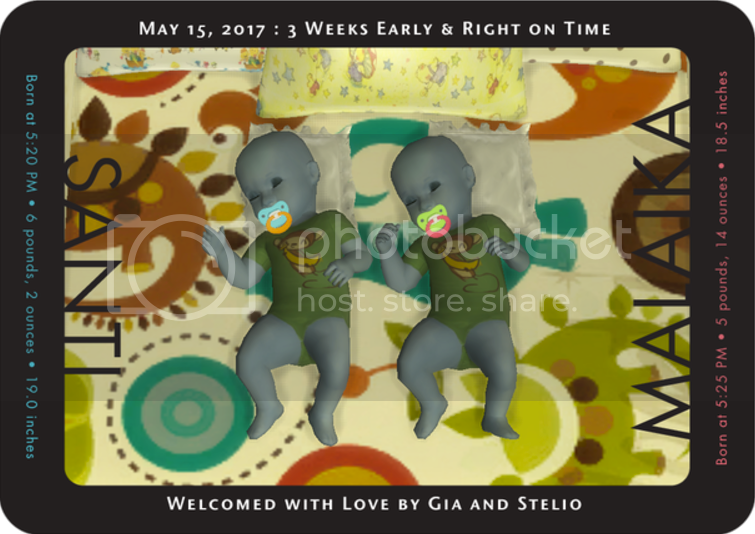 Stelio and Gia just had twins and are stating their own family adventure! The first story backtracks a little to Stelio and Gia's weeding day. 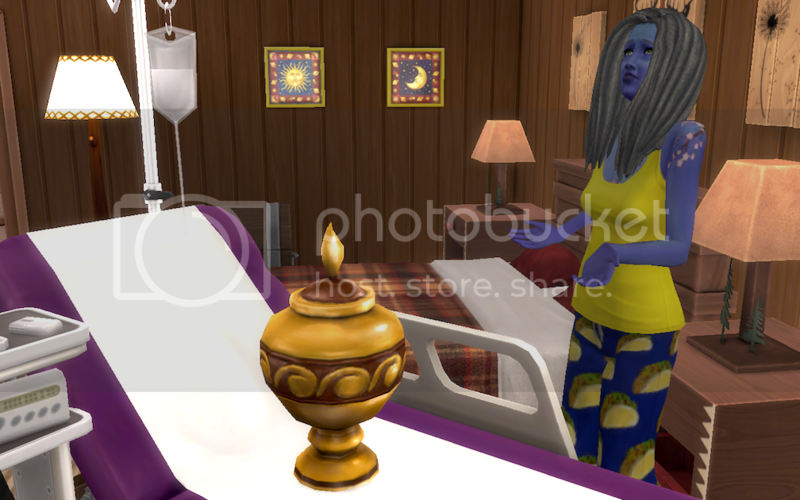 Akshara came home three days before her partner Andromeda’s Elder birthday. She’d responded as expected to initial treatments considering the advanced stage of her cancer, and Dr. Huff thought it just as well that Akshara spend a few days at home celebrating with her family. if she can keep Andi from seeing the ring first. 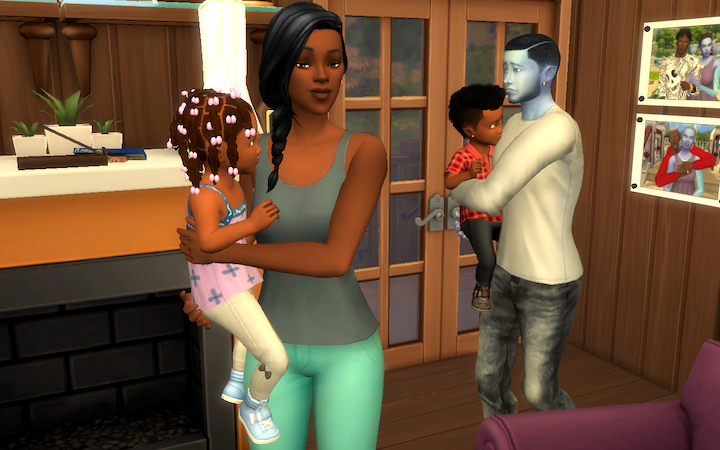 On Andi’s birthday, Gia and Stelio put the twins to bed early in order to help DeAndre and Akshara in the kitchen setting final touches for dinner. 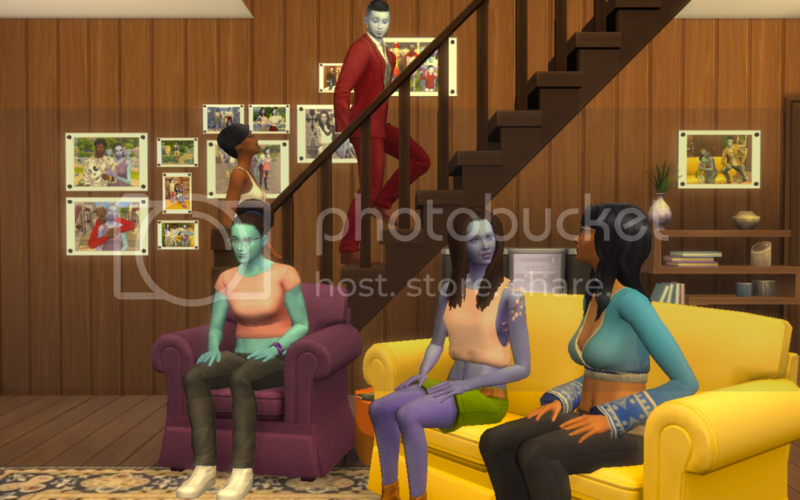 They made Andi’s favorite of Veggie Stir-fry, neatly placed several gifts on the table including the "Indigenous Plant Life of Widenburg" book she’d been hinting at recently, and Akshara carefully placed the ring near Andi’s seat. 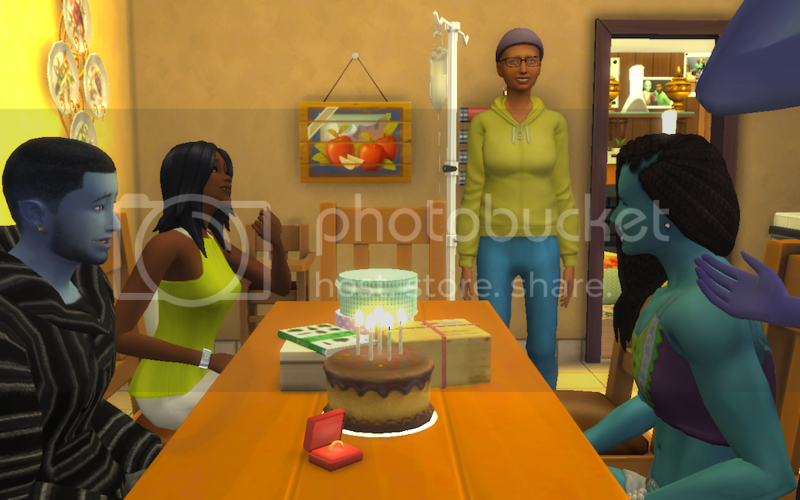 “Happy Birthday!”, they cheered as Andromeda entered, and moved toward her chair. “Thank you, family! 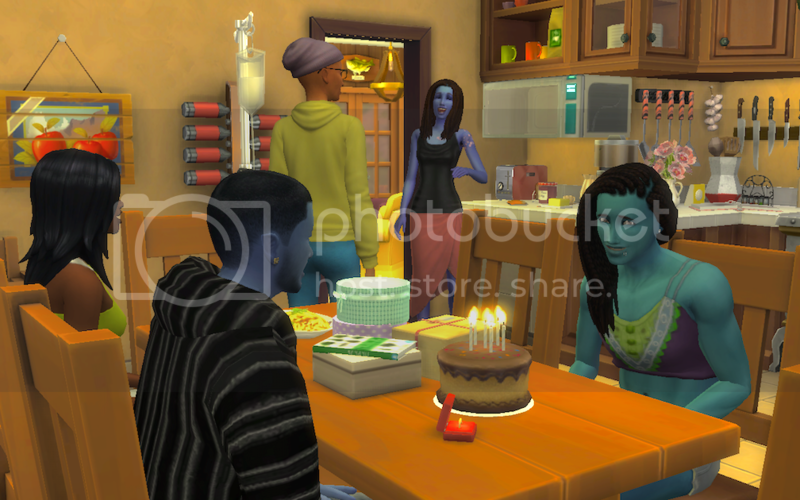 Is that the ChunkoChocoCake from the little vegan bakery in Newcrest? You really do love me! Oh, the food smells wonderful, let’s—,” Andromeda stopped short as she spotted the ring. Smiling and tears-welling, she looked at Akshara. Akshara began, “I know when we committed to each other that you didn’t see yourself getting married again anytime soon. But, we’ve been together for a long time now; we’ve raised two amazing kids." Andromeda obviously agreed. “Yes! Of course, I’ll marry you!”, she squealed as she dashed to Akshara and kissed her passionately. 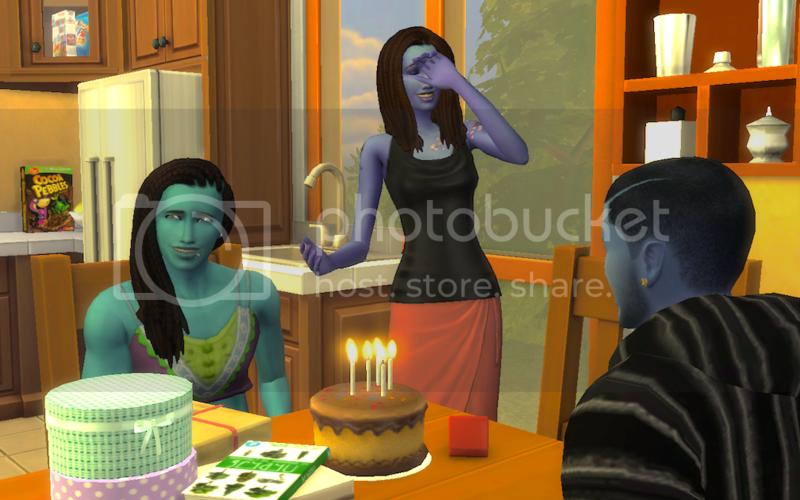 The family sat down to a lovely dinner, Andromeda blew out her candles and opened her gifts. After dinner, everyone retired for the evening. 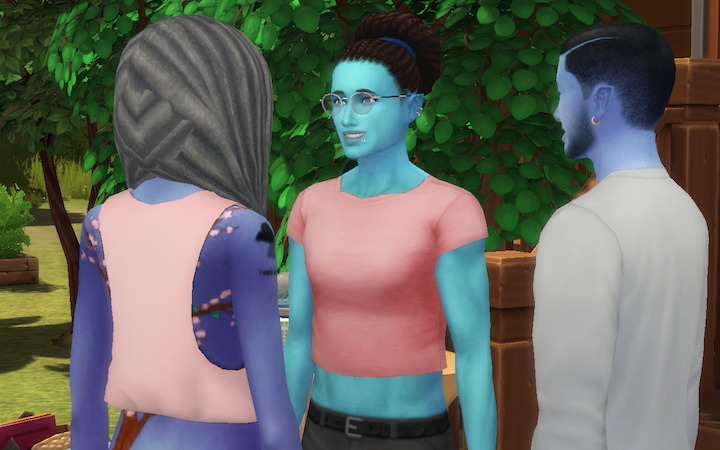 Akshara shuffled awkwardly as Andromeda escorted her back to their room; for several days, it had been difficult for her to stay upright for extended periods of time. Andi put her fiancée down to rest before hopping in the shower. 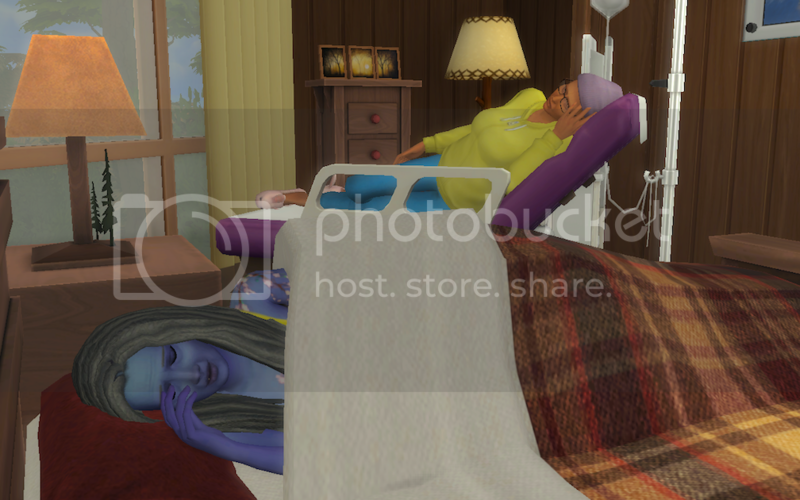 When she finished, she checked all of the sleeping Akshara’s vitals, kissed her forehead, and said goodnight. “I love you, too,” said Andromeda before laying down to sleep. Early the next morning, Andromeda awoke to the harsh, sustained pitch of the blood pressure monitor flat-lining. 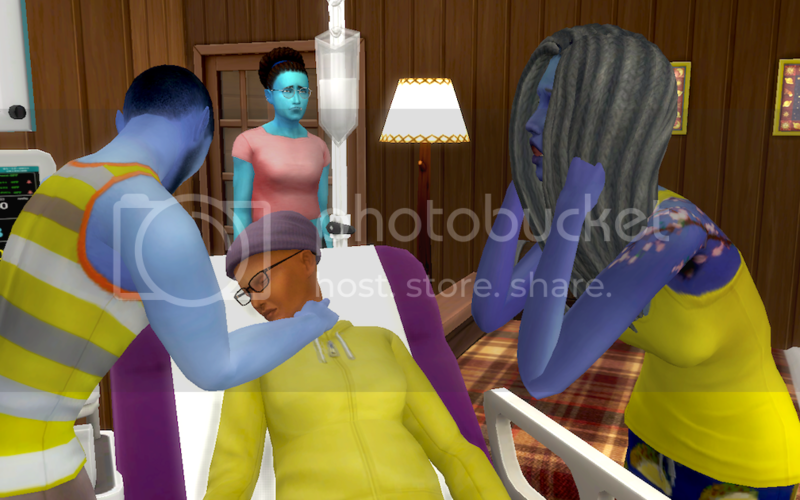 She immediately jumped to action; she yelled for Stelio to call the ambulance, pushed the medicines Dr. Huff had prescribed for a crash situation, and began giving chest compressions. After the fifth cycle of CPR, the siren wail still distant, Stelio checked Akshara’s pulse once more. He looked to Andi, and to DeAndre who had come to aid anyway they could; he didn’t know what else to do. A chill fell over the room, and they knew it was too late. The Grimm Reaper arrived, and Akshara was gone. 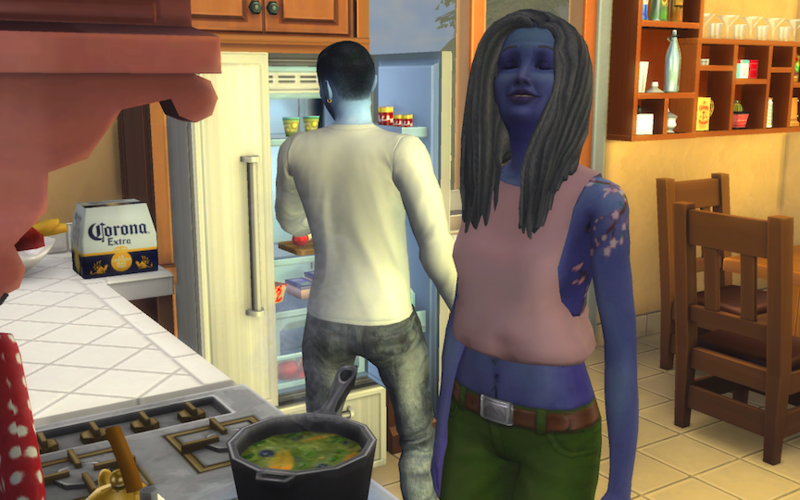 As Gia finished cooking the veggie casserole, she called the twins from the living room to the kitchen for dinner. Santi, ever hungry tyke, wobbled through the doorway as quickly as his little legs could carry him. But, Malaika didn’t follow. Gia called out for her again. No response. 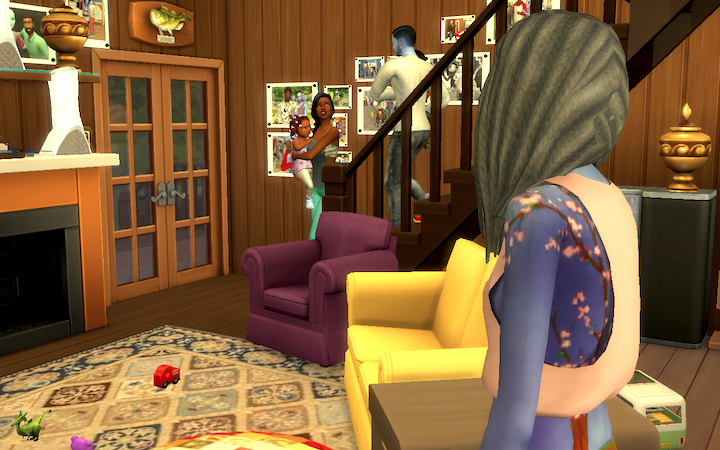 “What is your sister up to,” Gia queried aloud as she walked past Santi to the door. 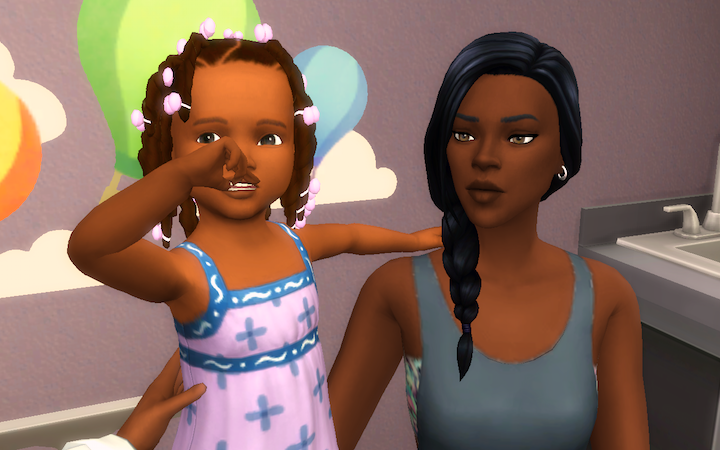 Gia found Malaika in the living room, playing with dolls and completely oblivious to her brother’s leaving or her mother’s arrival. “Malaika, sweetheart,” Gia called, in a moderate tone. The tot continued to play. 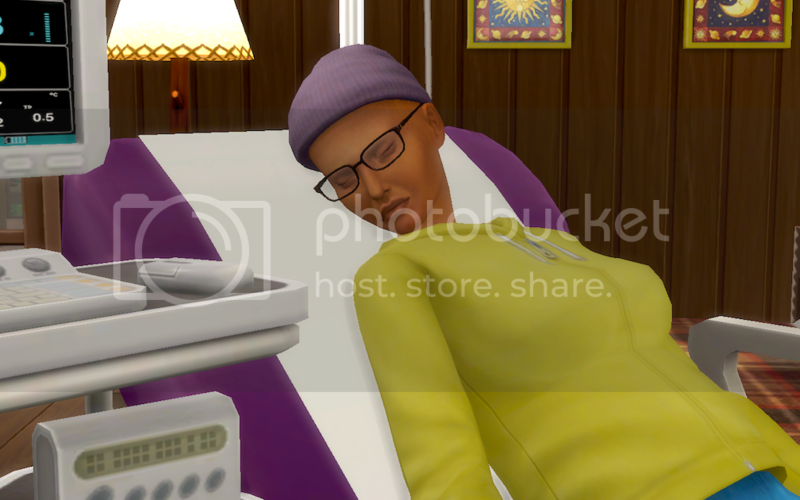 Dr. Huff nodded, taking in the information. “Ok, Mom. Based on her chart and the test given before your referral, I’m going to recommend another hearing test. 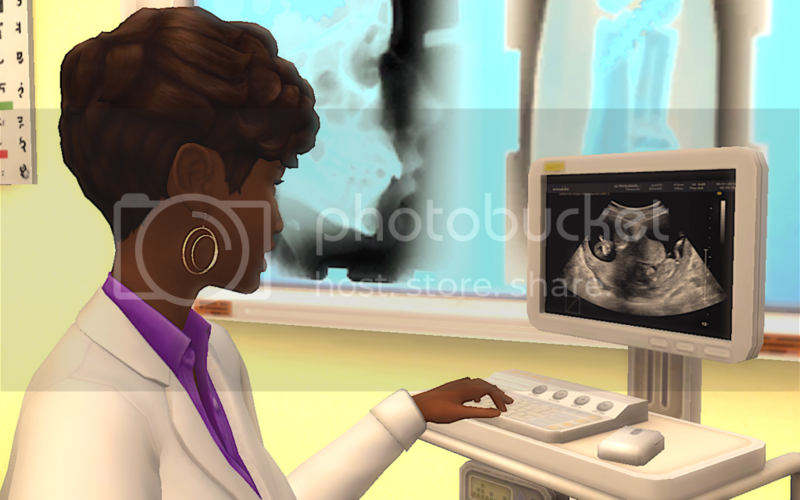 That’s going to give us an audiogram so we can figure out the type, range, and extent of Malaika’s hearing loss. 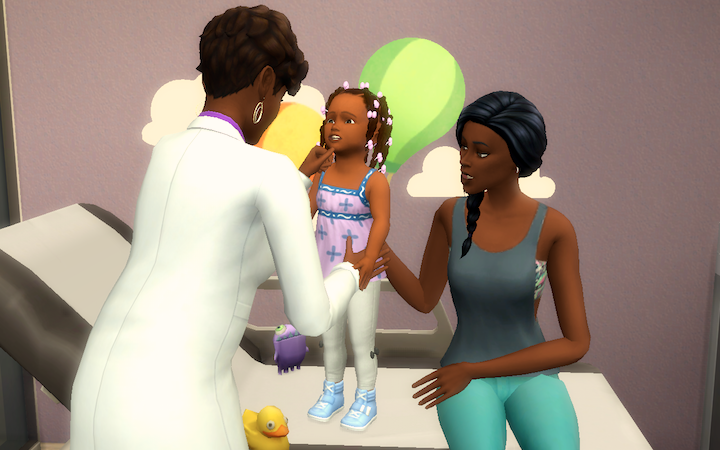 So, little one, shall we?” Dr. Huff reached to take Malaika to the testing room. Malaika recoiled. 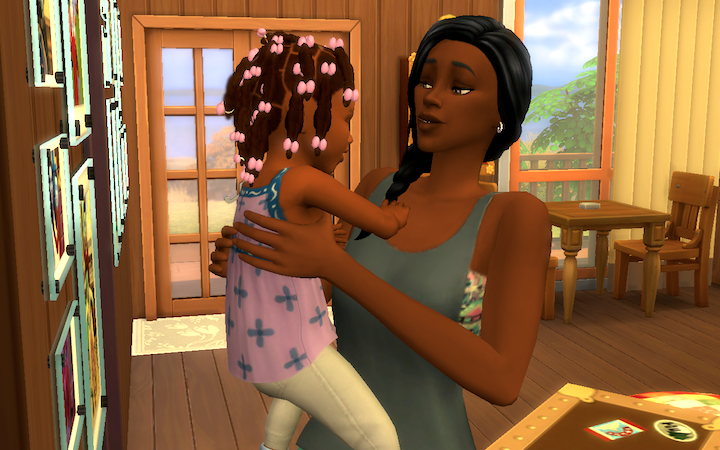 Doubting her daughter could hear or understand her, Gia still tried her best to sooth Malaika, turning her head to look her in the eyes and gently rubbing her back, she said, “You won’t be gone long. It’s gonna be ok. Momma will be right here.” Malaika stared at Gia and, surprisingly, her face began to relax; she stood upright. 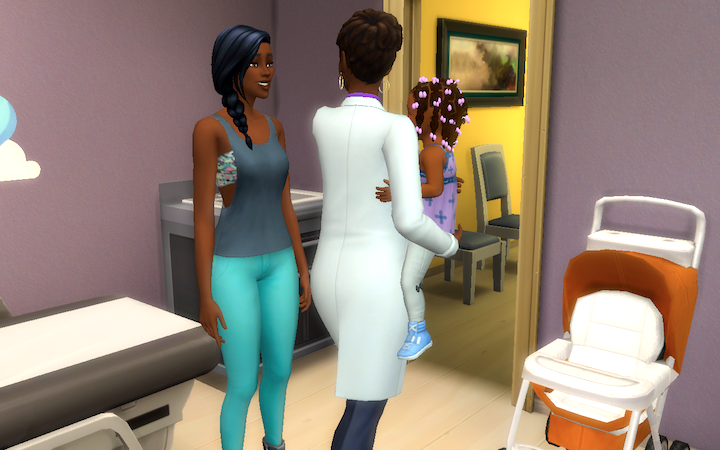 Dr. Huff reached for her again, this time Malaika allowed herself to be picked up. “We’ll be right back, Mom,” Dr. Huff smiled as they left the exam room. 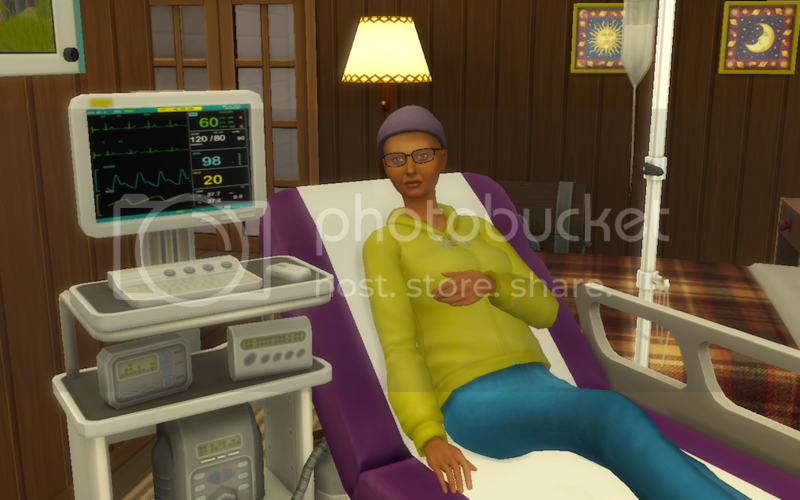 Gia quietly contemplated Dr. Huff’s diagnosis. 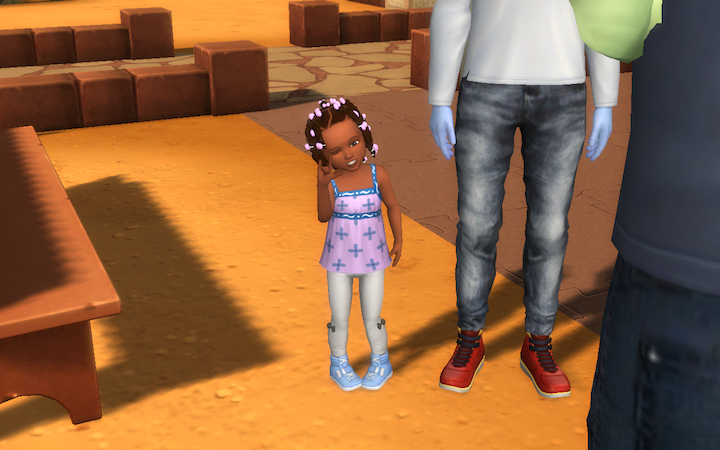 She thought about the times she and Stelio had given Malaika time outs for throwing tantrums or not obeying when, really, their baby just didn’t understand them most of the time. For that, she was heartbroken; but, in the wake of the news, she was also relieved. Now that they knew, now that they understood what was happening, they could be better parents, help their daughter navigate the hearing world, and connect her with the Deaf community so she could have people to relate to. 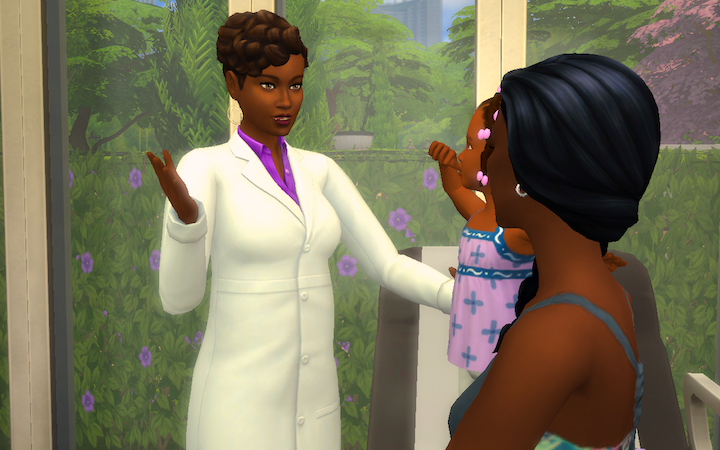 “Thank you for your help, Dr. Huff. 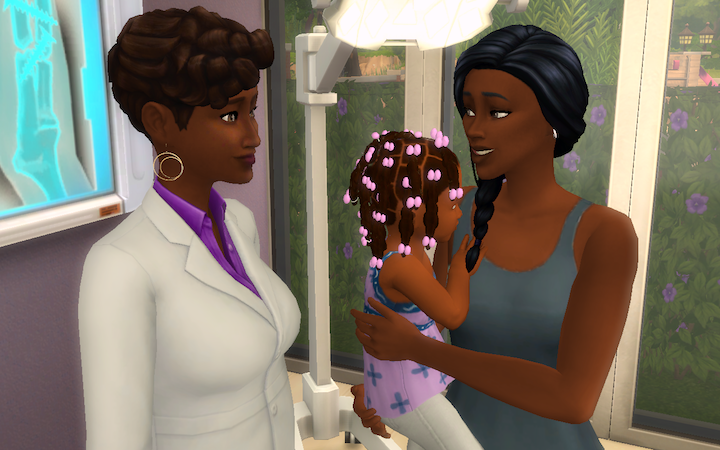 We’re gonna go home a start making a plan.” Gia smiled as they left Dr. Huff’s office, knowing these were the first steps of her daughter’s new life. It was late morning when Gia and Stelio descended the stairs, twins in arms. They’d spent the morning preparing the pair for an important event, finally meeting their grandfather… who doesn’t know they exist. Though Stelio'd kept a confident front the entire week leading up to the day, his doubts resurfaced the morning of the outing. The couple spoke as they entered the living room. “Ah, but Mooooom, they taste so awful,” winced Stelio. “Don’t dawdle, son. And, don’t deny the power of Fireleaf!” Andi chuckled as she turned on her heel into the kitchen. 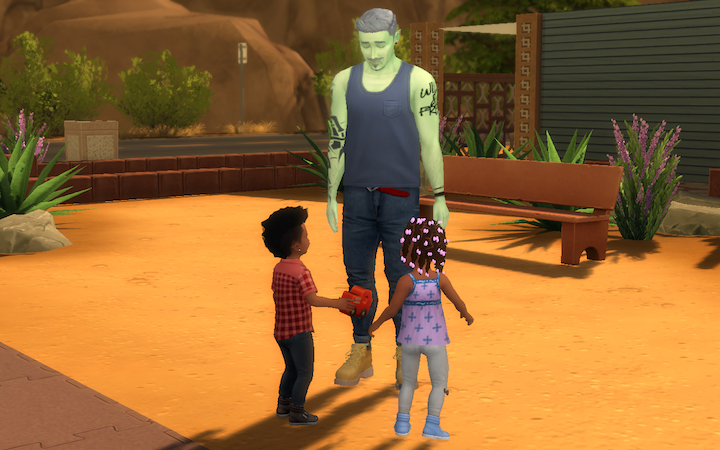 The crew arrived at the park 15 minutes early, so Stelio ushered the kiddies to the playground to pass the time. 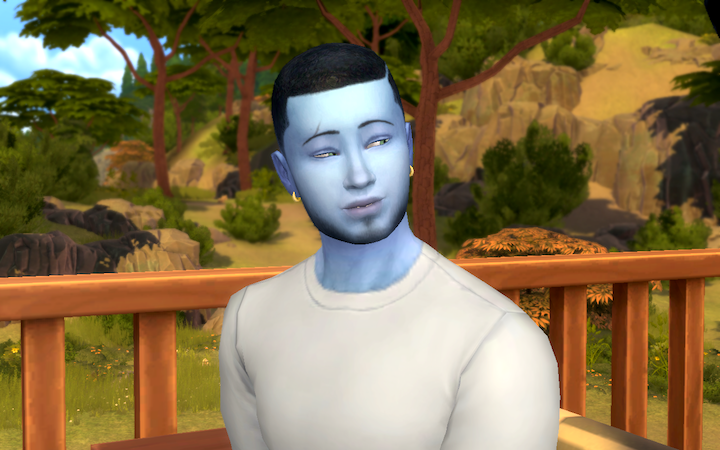 They were in the middle of an intense game of “Space Monster” when Stelio suddenly heard a familiar voice from behind. 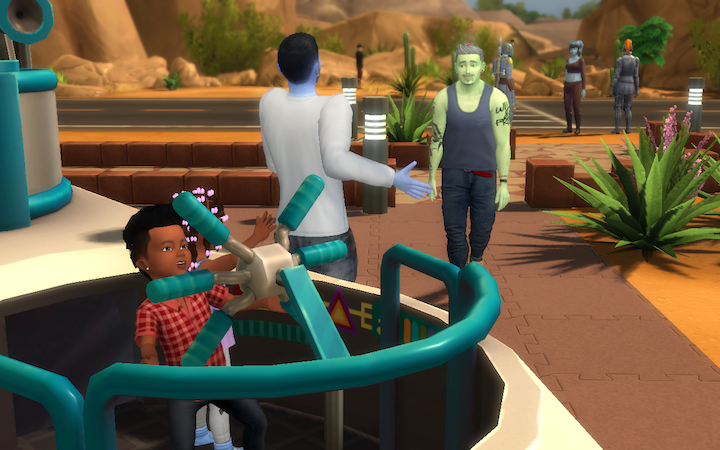 “Hey, son, thought that was you,” his old-man said gruffly; a little too much time on the bubble blower, though it didn’t show as much in his face. Dewayne was a silver fox, as they say. “But, uh, who’re the kids?” he grinned. 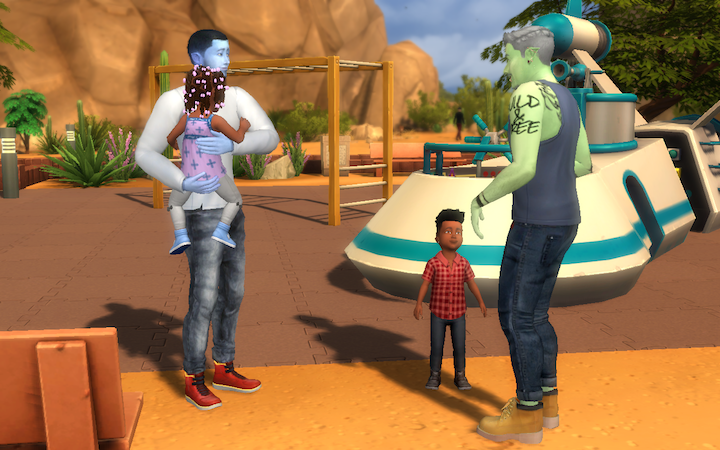 Seems to be taking it well, Stelio thought as he lifted the twins from the jungle gym, and lead them over to where Dewayne then stood. “Hey, kids. It’s so great to meet you”, Dewayne smiled. Malaika turned her gaze from Dewayne and looked expectantly at Stelio. 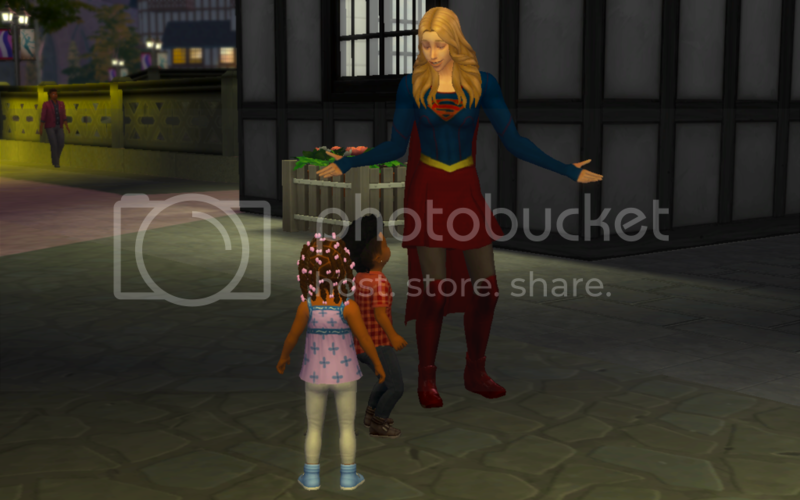 The twins got to meet Supergirl! Stelio made friends with Kara Danvers after meeting her at the Flea Market, and joining the Major Chords. They bonded over their alien heritage; her being Kryptonian, him an Earth-born descendant of Sixam. He took the twins on a club outing and, knowing they are big fans, asked Kara to show up as Supergirl. She happily obliged. Deandre was excited to get home from school. 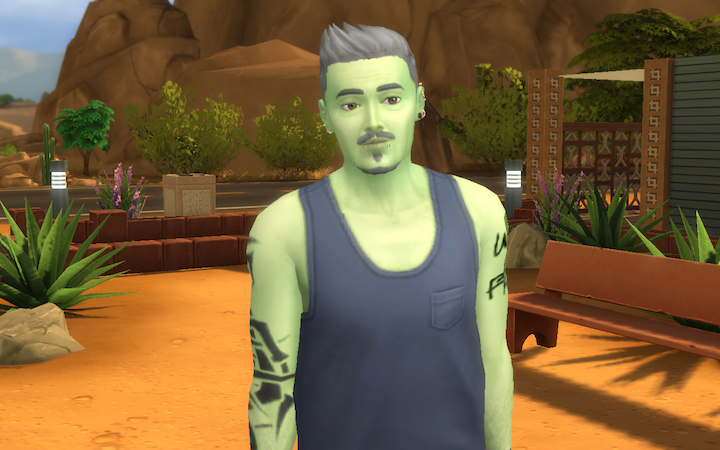 They’d placed an application for early admission to San Myshuno College of Art and Design several month ago and, even though they were only a high school junior, they hoped that their portfolio would give them an edge. The center piece was a tribute to Akshara that Dee sculpted from wood and photographed for the binder. They’d learned the skill from her, so they felt it was fitting. From the bus window, Dee saw the flag turned up on the mailbox. Their heart started racing as they steadily walked toward it. Anxious with anticipation, they opened the door to find the letter from SMCAD inside. After settling in from the day, Dee asked their mom, Andromeda to join them on the front porch. They wanted to tell her the news before anybody else, and immediately launched into it. 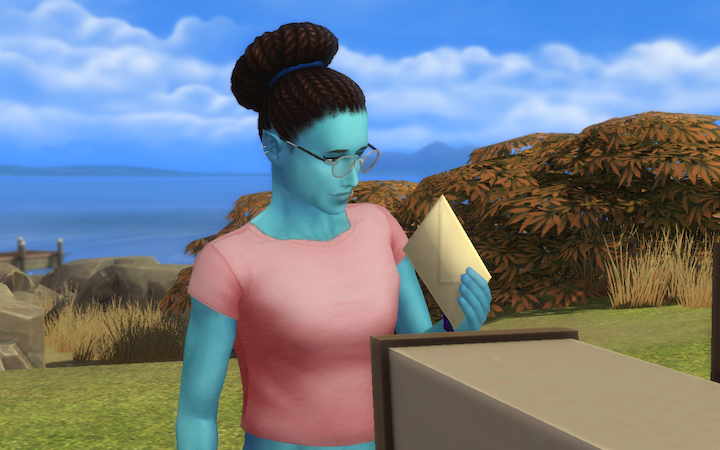 Andi lifted her gaze from the letter, and gently placed a hand on Dee’s resting in their lap. Her youngest was always so hard on themself, like they had something to prove no matter how much she assured them otherwise. “I know, sweetie. I know,” sighed Andi with a reminiscent smile, and a squeeze of Dee’s hand; and, the two sat for a moment thinking of her. 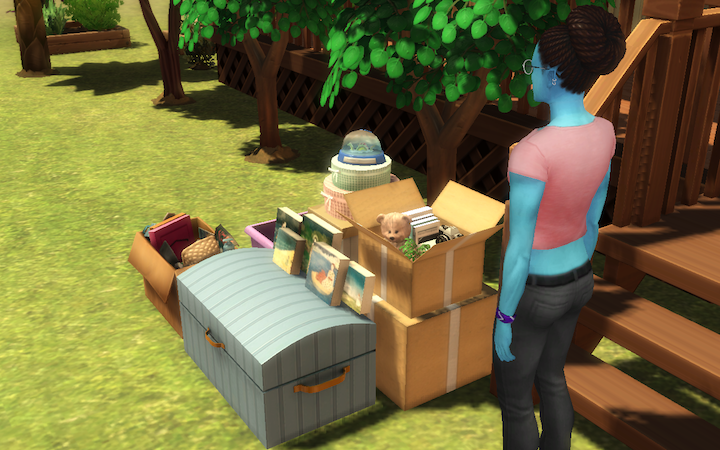 On moving day, Deandre sat the last box down by the porch, and stood back to admire the stack; their life was neatly packed up, ready to move from the only home they’d known. Shortly, Stelio appeared at the top of the stairs. “Wow, this is really it, huh,” Stelio asked, stopping to also survey the heap. “Look at my children, so good to each other,” Andromeda sighed blissfully as she approached. 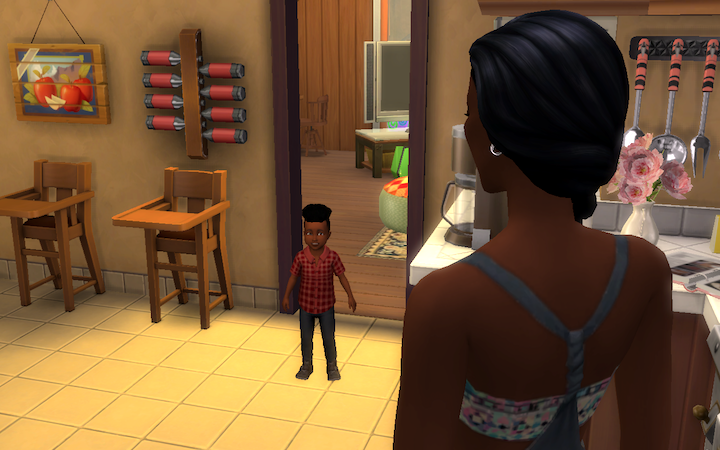 “Yes, Mom,” Dee grinned, exchanging a knowing look with Stelio. Dee would do as she asked, but they weren’t looking forward to the aftertaste. Andi had held her composure by busying herself helping all morning, but as she looked at the box holding Dee’s bear, Mr. Russ, she couldn’t hold back any longer. 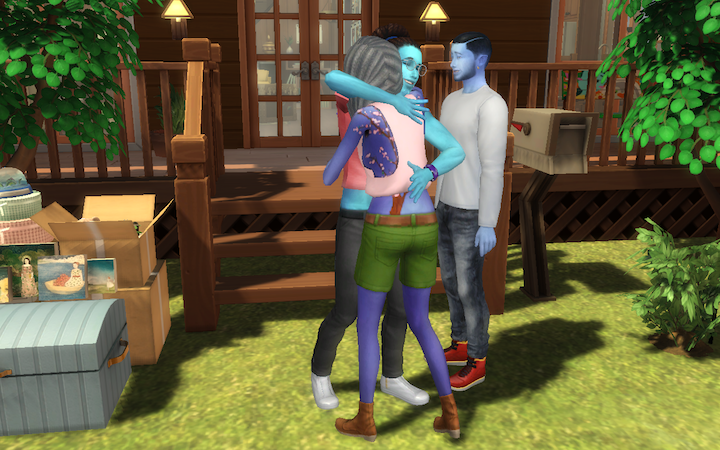 She sniffled, “Oh… I can’t believe my baby is leaving,” then pulled Dee into a hug that’d knock the wind out of a bear. “Oof! Wow, Mom,” they chuckled. Dee held their mom close and relished the moment. 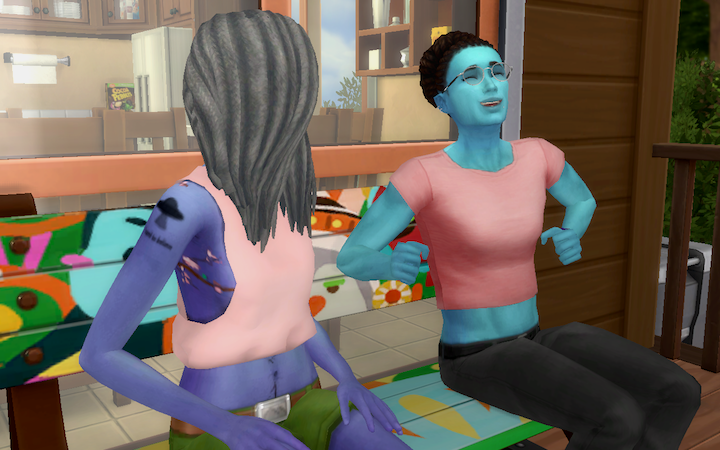 The two held each other for a minute before Andi stepped back to look at her child. Dee continued, “I’m only moving 30 minutes away. I’ll be back to visit, often. 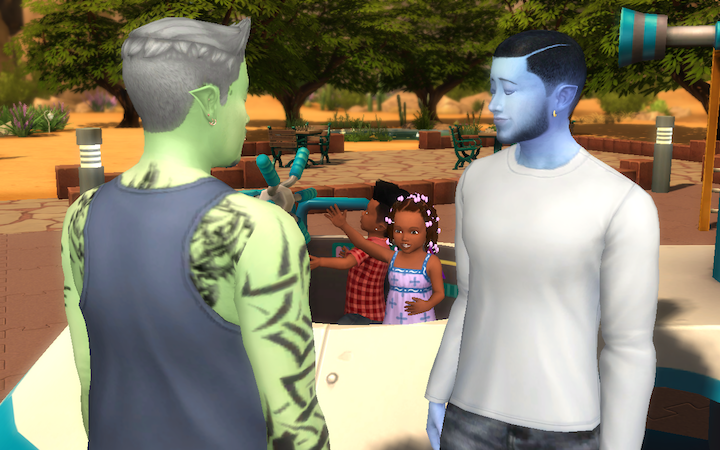 Can’t miss the little niblings growing up, right?” Finally, the taxi arrived to take DeAndre to San Myshuno and they loaded everything in. 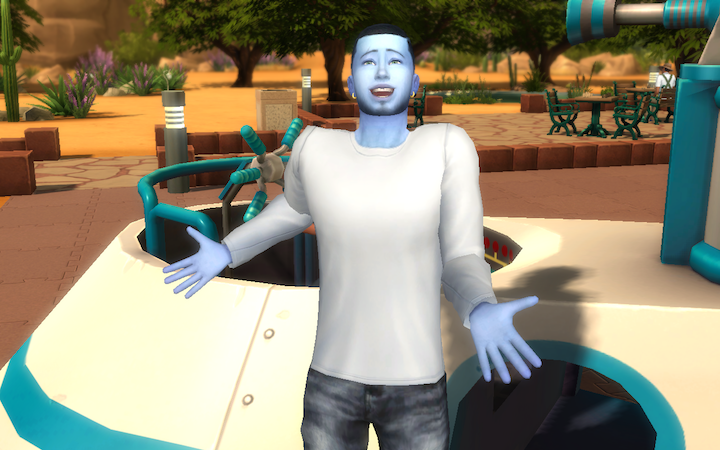 “I better get going if I’m going to be on time to meet Dr. Neidert at the student apartments. I’m really gonna miss y’all… I love you,” Dee choked, giving final hugs to their family. They turned toward the cab and, as they hopped in, flashed Andi and Stelio one last wink before heading to the city. 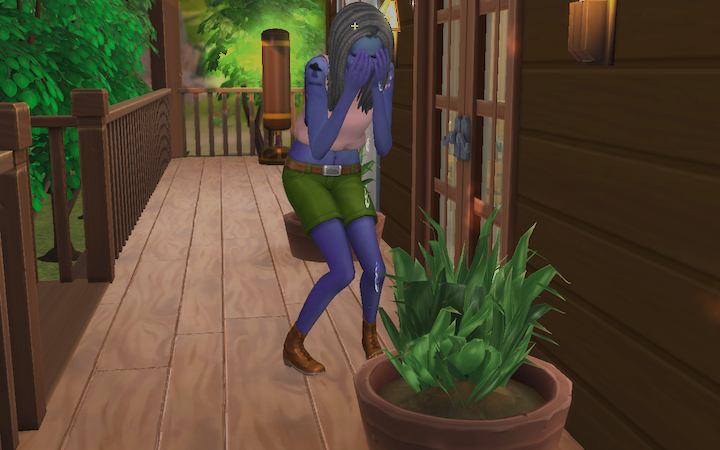 Later that evening, near sundown, Andromeda decided to meditate while tending to the garden and plants around the homestead. 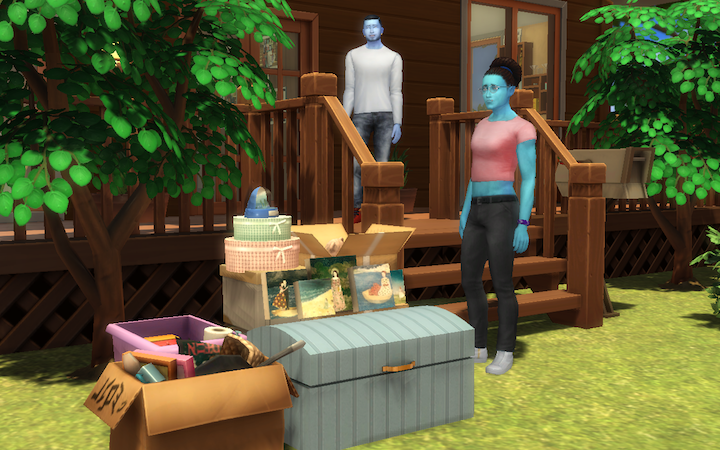 But, Andi struggled to connect with inner peace as thoughts of Akshara passing, DeAndre leaving, and recent talks of Stelio and crew moving to Newcrest to be closer to Malaika’s new school weighed on her mind. Eventually, the sadness became too much and she cried into the lilies Akshara had planted by the doorway on their third anniversary of building the cabin. Suddenly from behind came a sound she’d heard only once before, when her grandmother had come to visit her as a child… after passing. 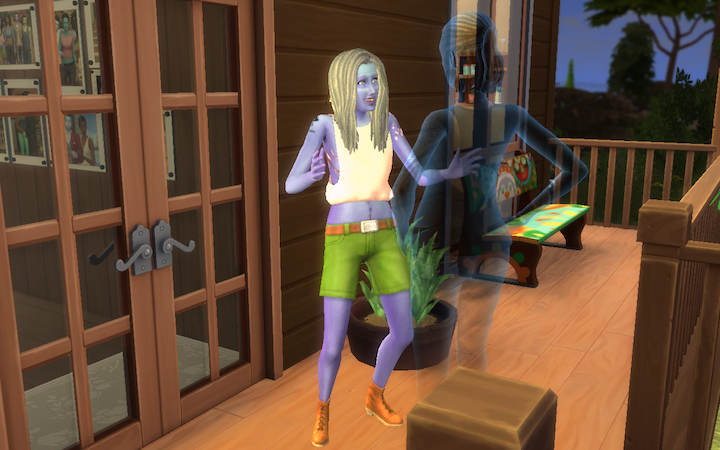 Andi turned quickly and was met by the ghost of her mother, Olvia Steel. And she looked good for dead, head tiltled confidently with a smirk that said “Yep, I’m here”. “MOM!” Andi shouted, mouth agape in surprise. 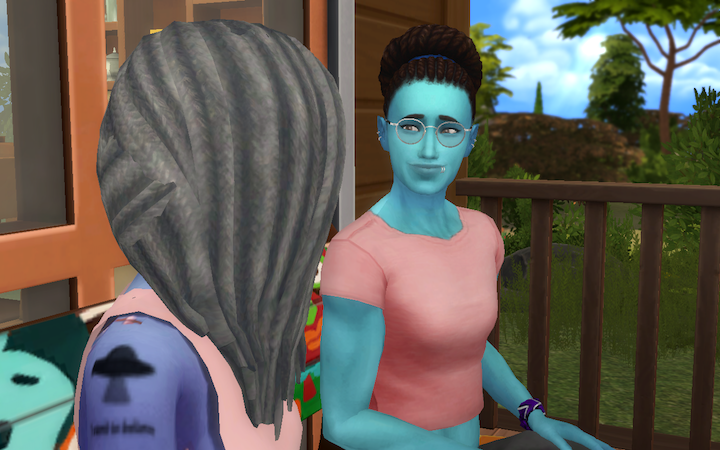 “Sweet girl, my, how you’ve grown,” said Olvia gently rubbing a hand down Andi’s silver hair. “How are you- What are you doing here,” Andi asked excitedly. “Your baby will always be your baby, as you are mine. And even those who have gone on are not gone forever. I mean, hello?” Olivia waved her waved her arms up and down her body in a “See?” fashion. Olivia held her daughter by the shoulders. “She may come, when and if the time is right. 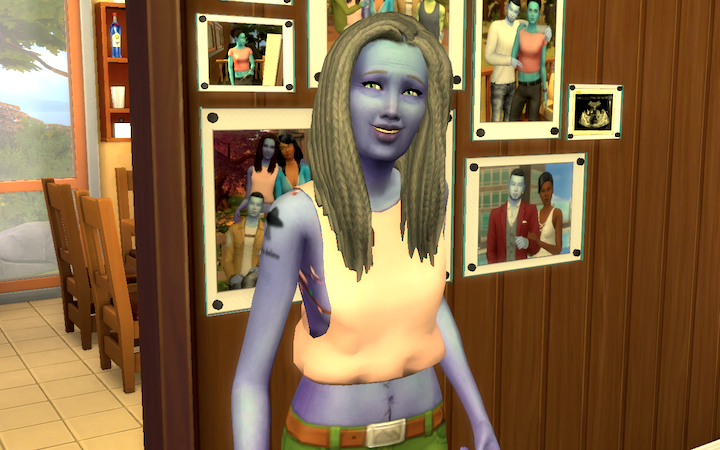 She’s adjusting to the afterlife and you have to learn how to carry on. 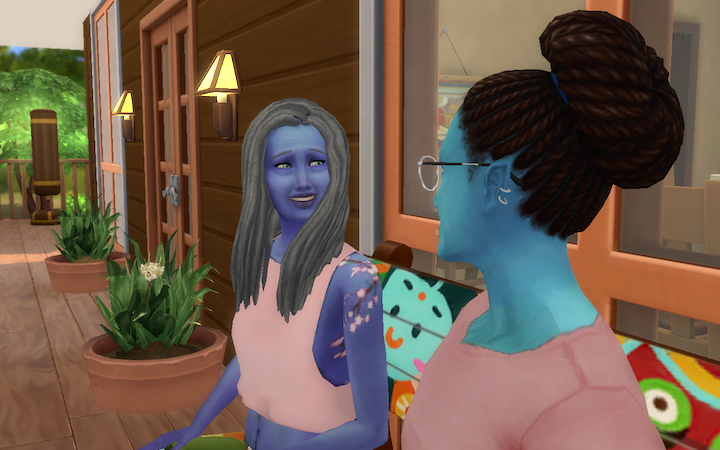 You’ve got so much life ahead of you, and she wants you to live it.” Olivia winked, and Andi couldn’t help but crack a smile, knowing Olivia carried some wisdom beyond her lifetime, and that that would be precisely what Akshara wanted. “I love you, Mom,” Andi choked as new tears sprang to her eyes. This time they were tears of relief at her new-found assurance that she wasn’t, and she would never be alone. “I love you too, dear heart” whispered Olivia as she vanished back to the Spirit World. Can't sleep. 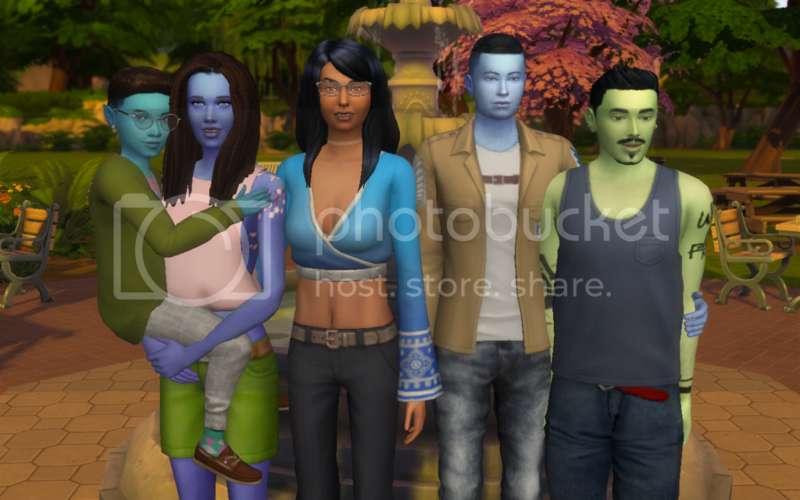 le sigh... Gonna post latest now, then I'll be a minute with the new pack before updating the story again. 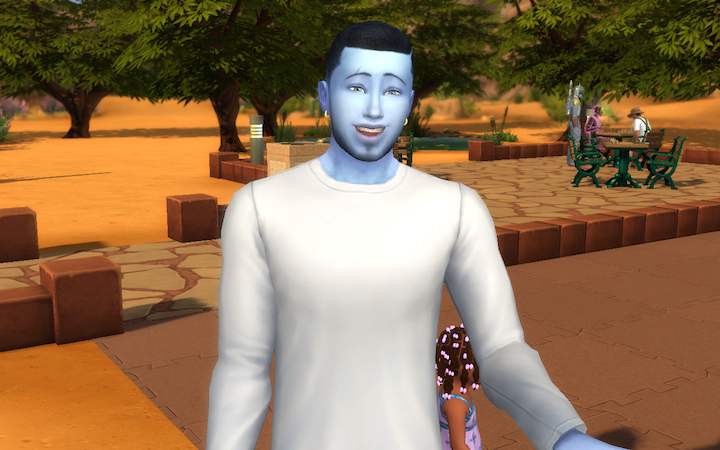 On Saturday evening, Stelio asked Andromeda to watch the twins so that he and Gia could have a date night; he planned to take her to dinner and a showing of Whimder Woman, then finish the night with drinks at home. 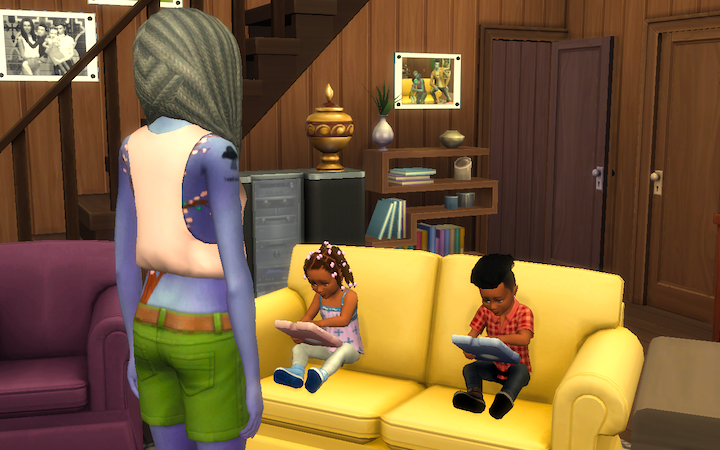 After seeing the parents out on their evening, Andi turned to Santi and Malaika seated on the couch, immersed in their tablets. She gently cleared her throat. No response from the tykes as blips and bloops filled the air. 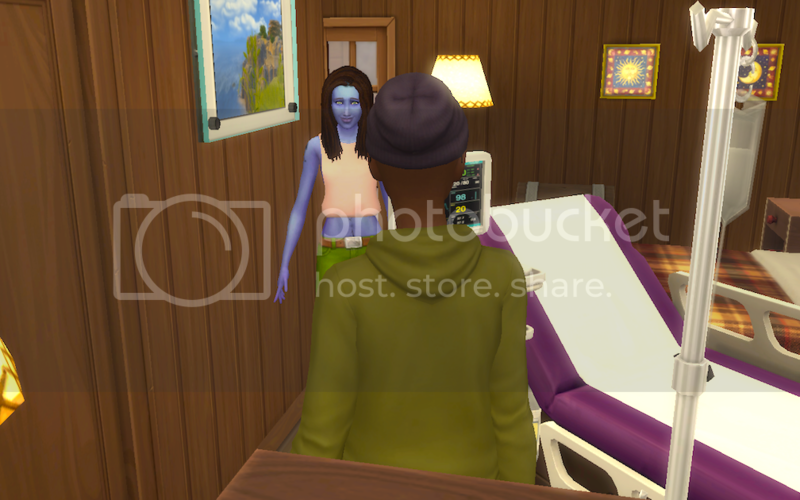 Santi’s eyes shot up from the screen, and he tapped his sister’s arm. At some point, he’d learned to catch her attention when they were both being addressed. 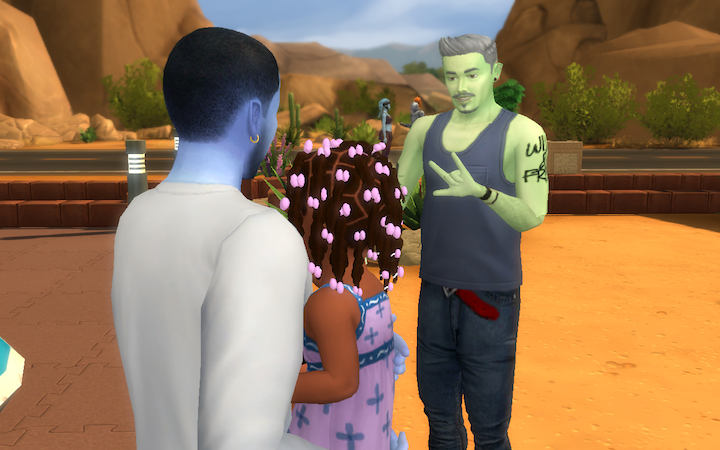 He’d also learned a few signs from the caregiver at the Newcrest School for the Deaf during a family tour and orientation; kids are sponges at his age, he took to it quickly and remembered quite a bit. He signed the word “book” for her, and pointed to Nana. 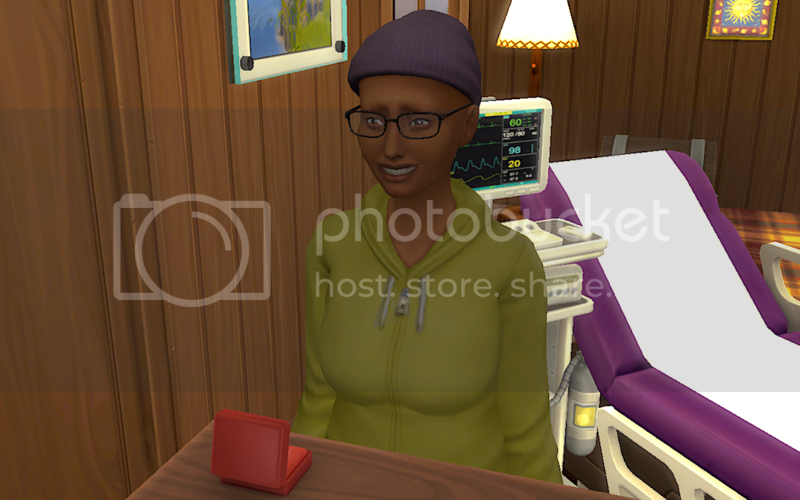 Malaika smiled, even if she couldn't hear, she liked looking at the pictures. 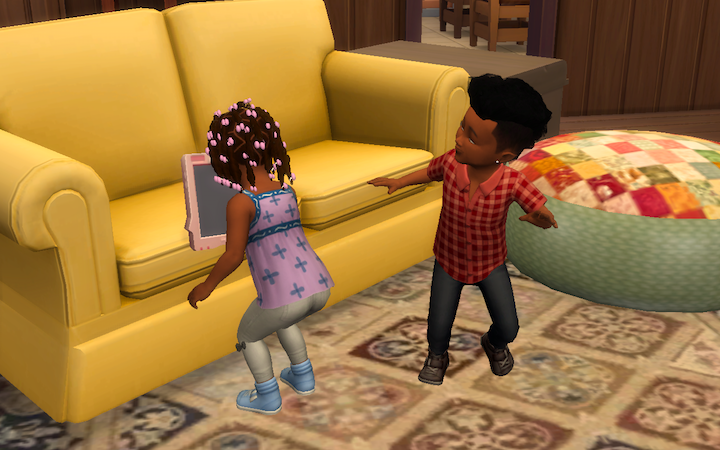 The pair giggled as they jumped from the couch. “I pick. I pick. Iiiii PICK,” he sang to himself as he toddled to the bookcase. He was a musical little tyke, no surprise with a musician for a father. While he made his selection, Malaika waved to get her Nana’s attention; she was signing something Andi recognized, but it took her a minute to get it. “Oh, milk! You want milk, Malaika,” she realized, and headed to the kitchen. She took the child's enthusiastic clapping as an affirmation. 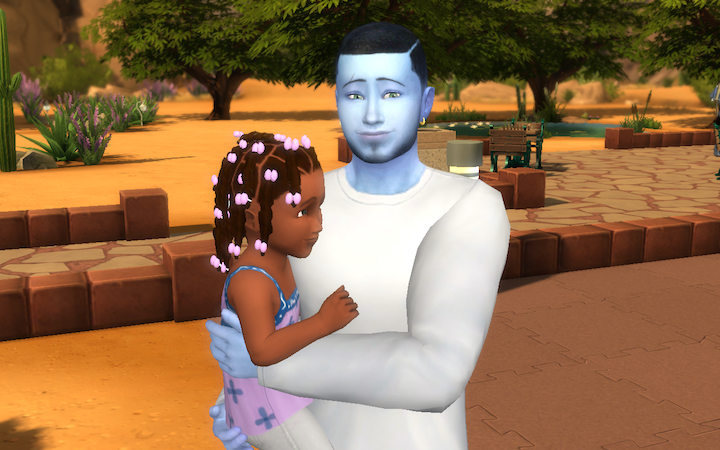 By the time Andi returned with the sippy for Malaika, Santi had chosen a book written by her sister, and his great-aunt, Callisto. Stephon Galaxy was a story Callisto wrote as a teenager, a story about a young half-alien boy and his alien family, "The Mighty Minerals", saving the planet from other aliens. 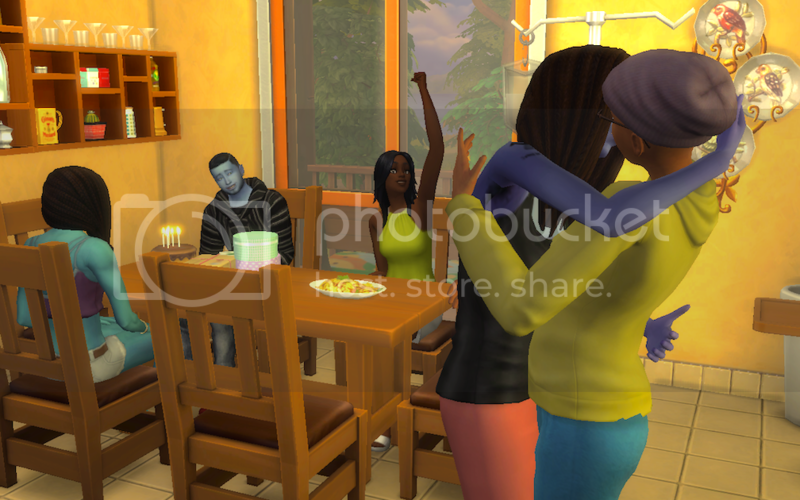 “Oh, great choice," she said, and beamed as she sat down between Santi and Malaika. 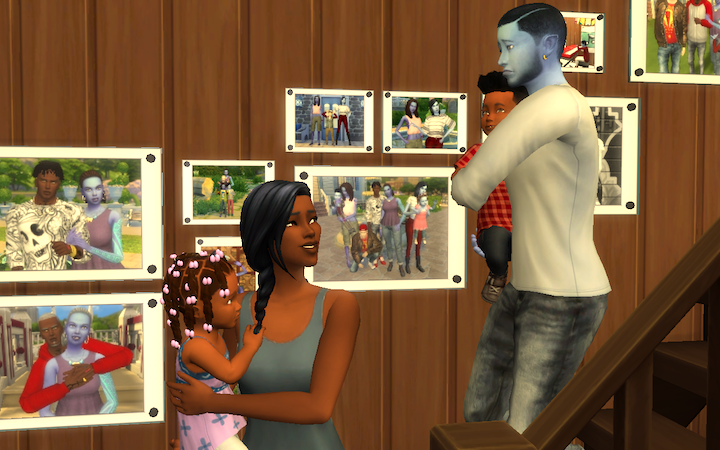 Santi danced at the praise before the twins snuggled up for the story. 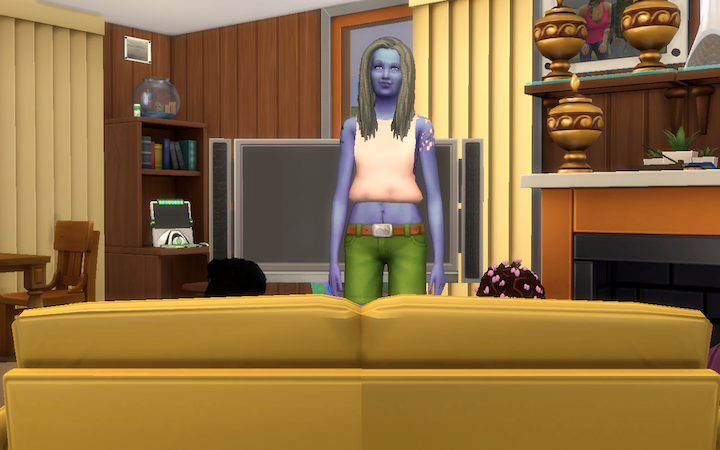 The couple arrived home before the twins were put to bed, but Andromeda assured them they wouldn’t be disturbed. Stelio lead Gia to the upper balcony of the cabin, overlooking the coast. 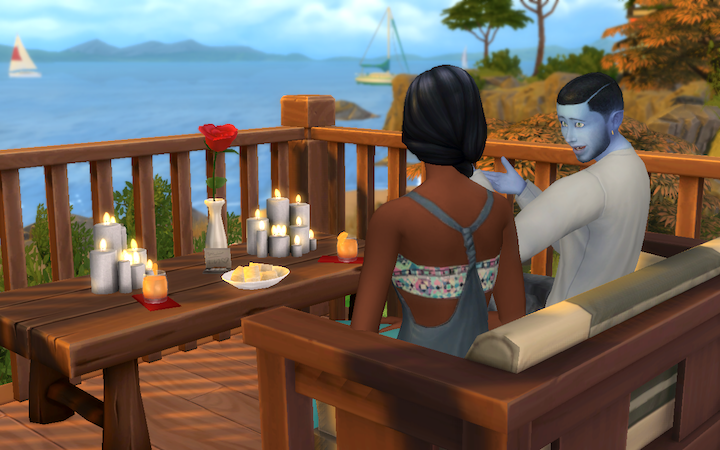 There he’d set up a romantic oasis. Gia was over the moon. 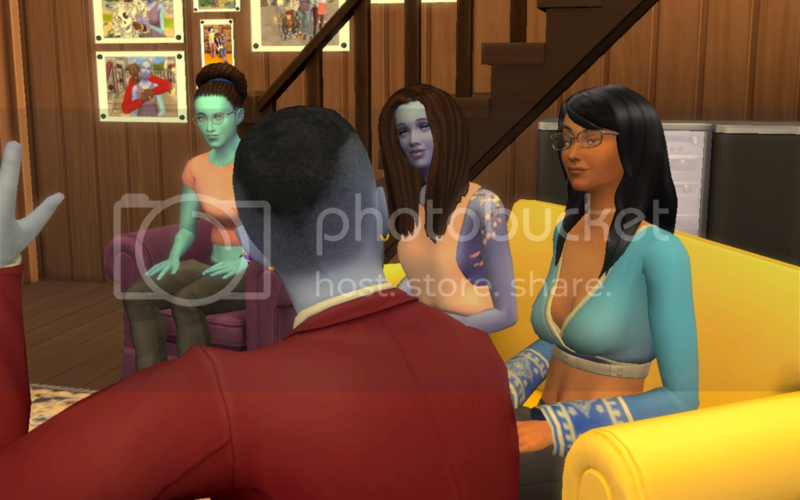 Gia laughed aloud this time, remembering the joyful Lightning Bug cosplayers they'd met that evening at the restaurant having dinner between convention panels. “Flatterer,” she snorted. Closing her eyes, Gia took a deep breath. It was always the plan to have more children. And Stelio made a compelling point about their ages, one she’d considered herself privately a few times before. Gia could feel Stelio watching her, though not with a pressuring gaze; he knew this was her process for big decisions. Even so, she wanted to give him an answer. She took another deep breath, then Gia opened her eyes. Spotting the rose bloom in the vase before her, she remembered the feeling of carrying Santi and Malaika, of holding them for the first time. And to have the chance to do it all again with the man she loved? She had her answer. Stelio beamed, “Deal,” and sealed it with a kiss. "Th-th-th-That's all (for now) folks!" Tune in after the Parenthood drop for more. Stelio was starving after another long night tickling the ivories down at the Dapper Llama Lounge. Luckily, he thought, this would be one of his last shifts. Entering the kitchen, he found Andromeda hovering over her cast iron pot. Saturday nights were reserved for curing and prepping tincture bases; fruity aromas wafted him as he passed, must be reducing Huckleberry extract. 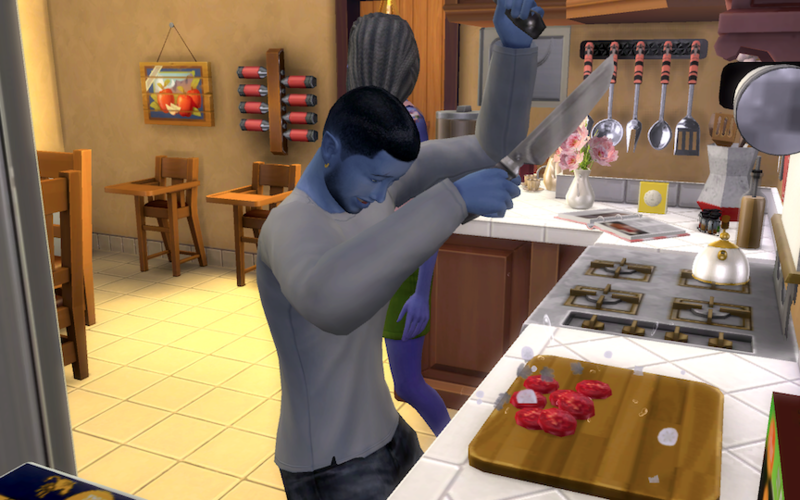 As he searched the fridge for anything to stop the crescendo-ing grumbles of his stomach, his thoughts turned to the fact that this would be one of the last times he’d walk into this kitchen for a meal. The down-payment on a new house in Newcrest, facilitated by an advance from Stelio’s new record label, had cleared that morning. And, the family was slated to move in less than two weeks. There was just one problem. Finally settled on a caprese salad, Stelio pulled some items, closed the fridge door, and placed the ingredients on the counter. The problem, he felt, was that he had not yet convinced his mom to go with them. 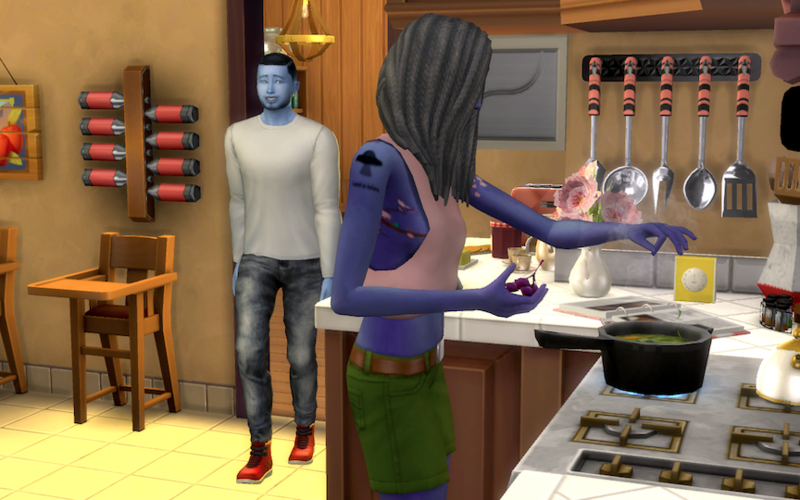 So when a second realization, that this would be one of the last times he’d walk in to see Andi brewing in the kitchen, rolled over him, he felt driven to give persuading her yet another try. Stelio felt famished by the time he’d cut everything up and finally sat down. He shoveled a fork full of crispy lettuce, juicy tomato, soft mozzarella and the tangy vinaigrette into his mouth before launching into his argument. “crunchcrunch I was- munchmunch- wondering if you had- crunchcrunch- given anymore thought to- gulp- moving with us. 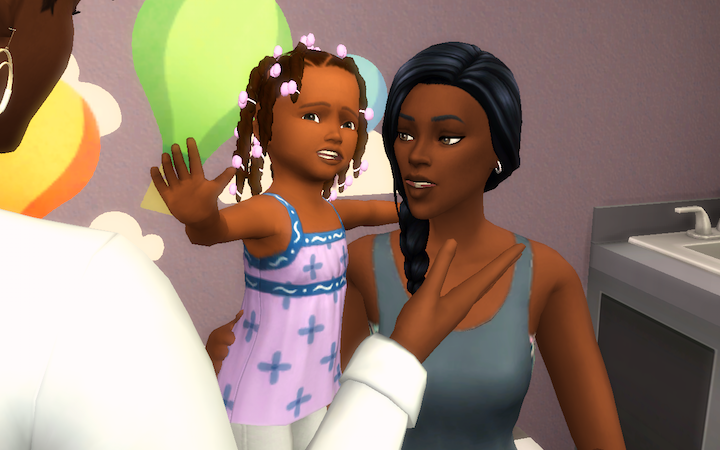 The check cleared this morning, and Gia and I think it’s best we move in before the twins’ birthday so that Malaika can start her new school program right away." From upstairs, rolled a sudden patter of little feet, giggles, a set of larger feet in quick pursuit, then a muffled reminder that after bath time comes jammies, not streaking. Stelio looked up, shook his head, and smiled. It was probably Santi giving Gia a hard time. However, going to help was a risky bet; Stelio’s presence could likely be the catalyst for another hour’s worth of sibling shenanigans. He decided he’d better beg Gia’s forgiveness for standing-by instead, and takeover breakfast in the morning. Besides, he still had business to attend to. “You’ll always have me, dear," Andi countered.